In order to achieve professional success in your immigration journey, you need to do a lot of research and get information that will prepare you for your new life. Career Pathways was created specifically for this reason. It will highlight in an easy way the information newcomer professionals need to know to succeed. It is a national, comprehensive and professional roadmap for skilled newcomers and is occupation specific. Here, you can start your research and find the resources and tools that contribute to your future success. Career Pathways is a 6-step guide that helps you understand how to become certified to work as a skilled professional in Canada; all the skills upgrading and job searching strategies that you need to succeed in the Canadian workplace. It offers resources about major employers and best locations for your profession. It even shows – through success stories – how other immigrants before you have walked on the path to professional success in Canada. You will find information that is specific and tailored to your occupation. All in one place! 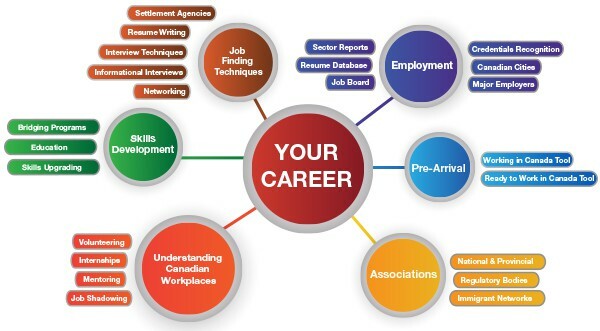 Career Pathways is divided into six sections and each has a few sub-sections of their own. Take some time to navigate the various sections and pathways. Note Career Pathways is only a guide and you will have to do more research to make a career plan that will work for you. It is not necessary to go through all the sections or in the order they are listed. Choose your profession from the list below and get started on your way to making the most of this valuable guide. *New professions will be added every month. So if you don’t see your profession here, please visit the page regularly or subscribe to our newsletter to ensure that you’ll be one of the first to get the information when it’s added. **The information listed in Career Pathways is for guidance purposes only and is up to date to the best of our knowledge. It is recommended that you contact the relevant body before taking any step.